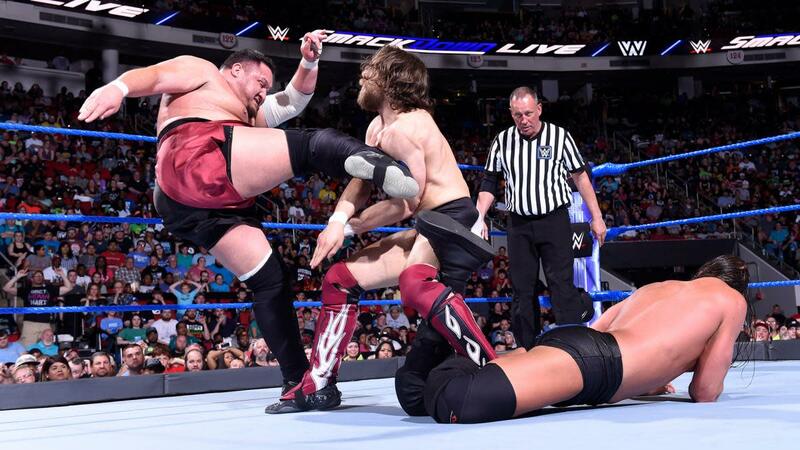 While Daniel Bryan and Samoa Joe did share the ring on last night's SmackDown, there was another person added to the mix. What was advertised to be Bryan and Joe's first match in WWE and their first time facing each other since 2006 turned into a triple threat as Big Cass was added. Cass interrupted them during the opening segment and laid them out before Paige made the triple threat main event official. Bryan hit the running knee on Cass and was going for the pin when Joe put on the Coquina Clutch and Bryan passed out. Cass then hit a big boot on Bryan after the match. With Joe winning, he joins Braun Strowman, Finn Balor, The Miz, Rusev, Bobby Roode, Kevin Owens, and a member of The New Day in the men's Money in the Bank ladder match. Also on SmackDown, Shinsuke Nakamura took on Tye Dillinger, Asuka faced Mandy Rose, Naomi and Lana had a dance-off, and The New Day teamed against The Miz, Cesaro & Sheamus.